Waiting in our Little Love Nest in Tuscany. See you and Love. So recently we have been talking about our little love nest…. Hopefully in the near future, that plan and dream will be fulfilled. Recently I had the opportunity to be with him for a couple of days, in an actual home. For once I felt like I experienced an actual opportunity to “live” with him. He cooked while I wash, he does his research while I entertain myself. We eat together, wash up together, shower together, watch TV and take naps together. That feeling of home is something I haven’t felt in a long time. It was so blissful I felt terribly emotional when I had to go home and couldn’t stay for the night. Little Love Nest is the place of Love and Gratitude of our guests. Thank you Marusca. Somewhere in Tuscany. Doing what I love. Italian Coffee: a true passion! 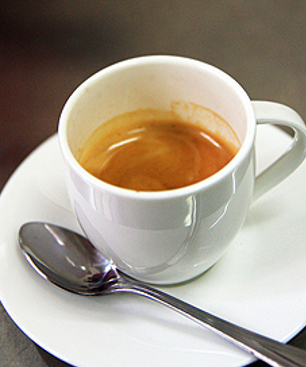 Welcome to our page where we explain how to make italian coffee . This page is dedicated primarily to those who would make a good coffee Italian Coffee in our Holiday House in Tuscany “Cappannelle” and in our Little Love Nest. Nothing like a good cup of coffee can to remind Italians their homeland. If you are traveling abroad desperately want an espresso, the taste is as close as much as possible, to what I am used to drink in Italy. 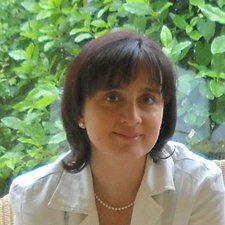 Italians love to talk about coffee as something that belongs to them, forgetting that they are other nations that have introduced, as well as other are those who produce it and distribute it. And in the same way seem to forget that there are different ways to prepare coffee, or better, while being aware of the existence of Turkish coffee, soluble than American coffee along French believe that the only acceptable way and can to enhance the better the taste is theirs; espresso coffee is that, while not forgetting the brewed coffee at home with the so-called “moka”. They have made the word “espresso”, derived from the machines to prepare and “moka”, from the city of Yemen. C. the collection tank, in which the coffee ‘that comes out is collected. The machine must be treated with care. The boiler is provided with a safety valve if the pressure rise excessively due to clogging of the filters. On the lower part of the pot is placed a small filter that prevents the coffee powder to finish in the pot together with a drink. This filter is held in place by a seal which also has the purpose of avoiding losses between the base and the jug when questei are screwed together. 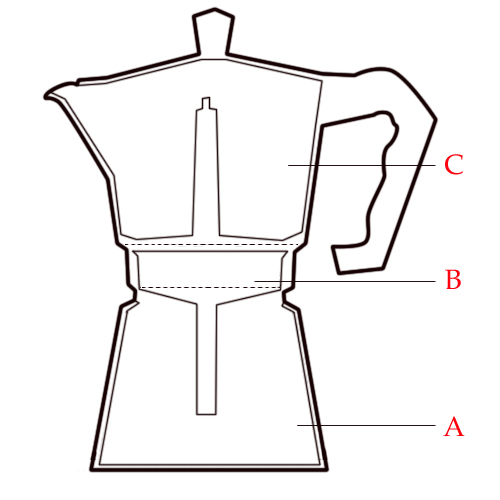 Making coffee with moka The rules for making coffee with mocha are relatively simple. 4 – turn off the coffee maker before all the coffee has run out, when the liquid begins to present hints of foam. The last coffee that comes out, is increasingly diluted and of low quality. The most important points are the first three, the last is a detail a bit ‘purists and implies a particular attention, because you have to be in front of the coffee maker to control when the coffee spout and turn it off in time, in other words you lose the convenience of “feel” when it’s ready coffee thanks to the classic hum issuing the mocha coffee as she leaves the last. Many will lift the lid of the coffee maker to prevent condensation from falling into the coffee. 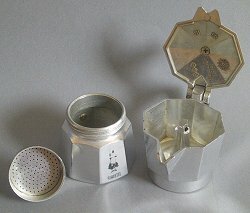 I highly doubt that a few drops of condensation (if it was to fall in coffee) can dilute the coffee significantly (if you do not believe you do a blind test and scientifically solve the issue), I honestly prefer a coffee diluted with a few drops water rather than soil the stove every time I prepare a cup of coffee! It is recommended to be very careful in the choice of coffee ‘. If you want to save on the mixture, you should buy one soluble (and so ‘equal bad!) If you intend to make a cup of coffee’ long, you should not do it. Buy it ground well, but it would be preferable if you have the necessary beans to grind. Very important factor in the success of coffee ‘and’ water. This must ‘be sufficiently pure to ensure the natural flavor of fine drink. It is recommended to be very careful in the choice of coffee ‘. We recommend the use of spring water or in his absence a natural mineral. Typically the coffee ‘is served in a special container called cup. This includes functionality ‘and aesthetics and that if preheated eliminates heat loss of the valuable leachate. Pour the water source heads’ described inside the boiler, until it has reached a level slightly lower than that of the valve. Place the filter inside the boiler with elegant movement and delicate. WARNING: Because the difficulties’ objective connected it is recommended to do so only trained and qualified personnel. Fill the filter and adjust properly the coffee ‘with the edge of the spoon. do not ever press the coffee ‘with a spoon, but follow the instructions on the next page. Place the coffee ‘with the edge of the spoon, until obtaining a light dome. This will allow ‘to get the right pressing of coffee’ and the perfect adherence of the same to the upper filter after the screwing of the collection tank. Tighten the machine in order to avoid leakage of steam and water in her ascent in the soul. Wait for the coffee ‘escape producing the typical foam, the classic final gurgle and the incomparable aroma. ATTENTION: turn off the coffee ‘immediately after the foam to avoid unpleasant sensations of burning. Turn the coffee ‘before you drink it, in order to homogenize the most’ dense out first with the more ‘light that comes out in the end. If this and ‘unimportant in a machine of one, is crucial for machines for greater capacity. Pour the coffee ‘in the cup already prepared. Better if heated. Taste voluptuously in short sips wonderful beverage prepared. The character assumed by bitter coffee ‘is typical of this type of preparation. To enjoy the best the product you are strongly advised not to use sugar. However, because of natural bitter taste of coffee ‘produced with the “mocha”, those who wish can’ add sugar to taste. MODE ‘Advanced OF USE SUGAR: allows a rich lather over coffee’. First, prepare a glass with sugar needed to satisfy the audience. Take the first drops of coffee ‘coming out of the pot and pour in the sugar. E ‘need to pay only the first drops, which are the most’ dense. Pour the first drops in the sugar making sure to leave a compound in which the prevalence of sugar in coffee ‘represents the smallest part. Turn vigorously with the help of a spoon until you get a creamy dense, saturated with sugar and light brown. The mixture should look like this and this consistency. Creminina put in the cup and pour the coffee. ‘ You get so ‘a rich and cream moving surface. The machine must only be rinsed with water and left to dry. WARNING: never wash with soap. To make sure the coffee ‘a lingering aroma we recommend storage in the refrigerator, after proper sealing.